I have a 5 year old and an 8 year old, will they be together? Yes. 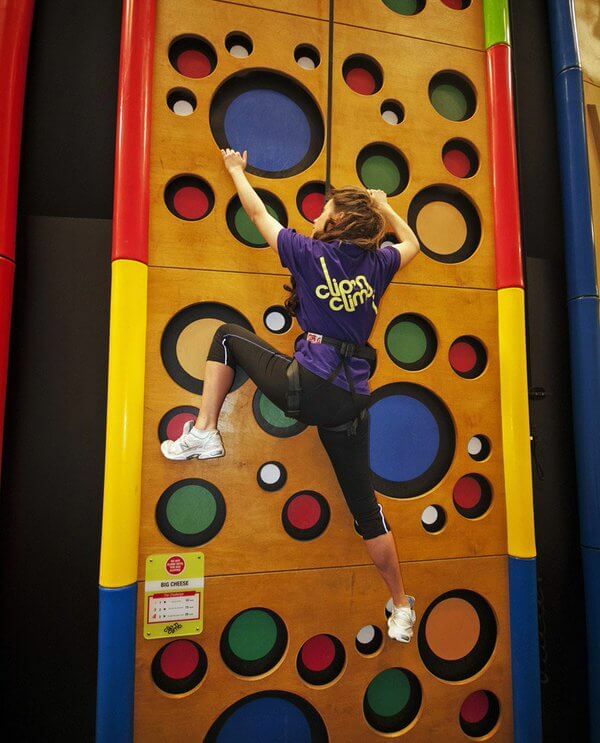 One of the great things about Clip ‘n Climb is that everyone climbs together! Do parents have to stay with the climbers the whole time? Must my child be 4? What if they are 4 in 2 weeks? Unfortunately, although we all know that little monkeys can be awesome climbers, our minimum age is 4. It is the parent’s responsibility to ensure that their children are old enough to participate. If we become aware that a participant is underage, we are required to cease climbing and in this instance, you will not be entitled to a refund. We are soon to be introducing a toddler climb for ages, 2-4 so please enquire when this becomes available. 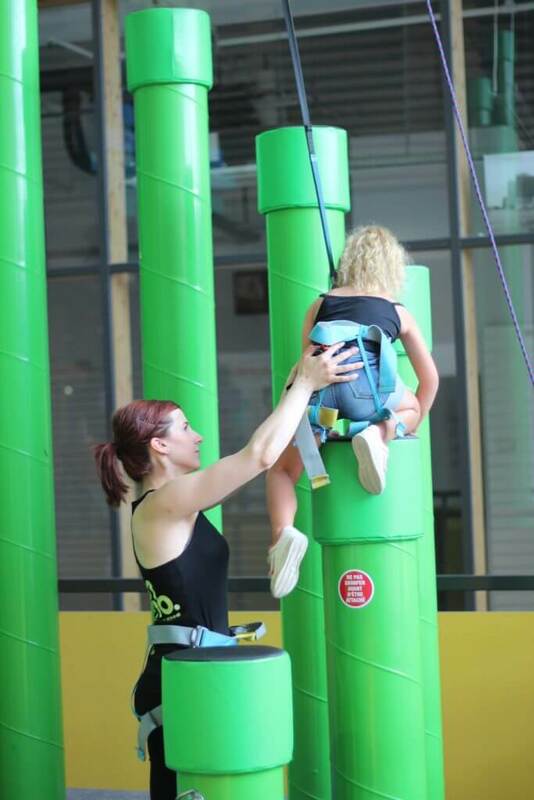 My child has never climbed before, can I just book a session? How does it work? Yes you can just book them into a session. Sessions are available for complete novices or even our regular weekly Clip ‘n Climbers. All climbers must attend our safety briefing and harness fitting. There are a range of climbing challenges in the arena which all work through the use of auto belays. My child has done the Leap of Faith/Vertical Drop Slide before, will he be allowed to do it again? The Vertical Drop Slide are subject to an additional cost of £2.50 as well as time and height restrictions of 120cm. We will endeavour to allow as many people as possible to participate, however please be understanding if there’s a wait on busier days. Unused tickets are transferable to your next visit, alternatively, we are happy to refund unused tickets. If you have already participated once and wish to have a second jump please be understanding towards other people wishing to take part. We will allow a second go whenever time restrictions allow. There is a height chart available at the centre. We have a kitting up area with lockers where you can store coats bags and valuables. Any personal belongings are left at the owner’s risk. What is suitable footwear & clothing? We do not allow participants to wear any open-toed shoes or high heels. So, unfortunately, this means that you cannot wear Crocs, flip flops or sandals. It is also really difficult to climb in wellies! We recommend that participants wear loose comfortable clothes that do not restrict movement. Please do not wear skirts or dresses. Sessions last approximately 1 hour and a half. The first half hour is a safety briefing and harness fitting (this may be shorter during quiet sessions). There is then approximately an hour climbing in the arena. 10 am – 11 am: Climbing time! 11 am – Collect back harnesses & pats on the back all-round for being awesome! Can adults climb? Will they be in the same area as the kids? 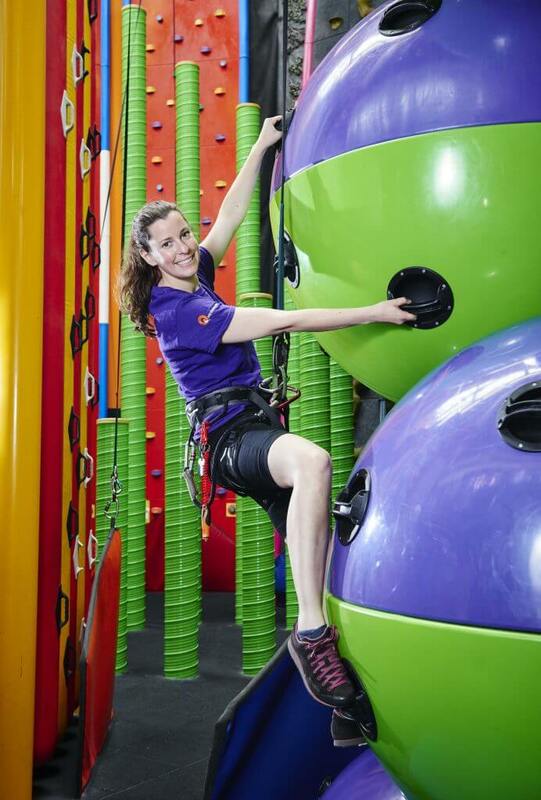 Of course, adults can have a go too – we don’t think the fun should just be for the kids! At Clip ‘n Climb you all participate in the same arena. Volunteering as a Clipper is a great way to be involved in the experience without committing to climbing yourself. Joining participants onto the safety lines is an easy and we will show you how it works safely at the start of the session. It’s a great way to promote family interaction or involve all members of a group. Do I have to be a Clipper? No. it is entirely up to you. Volunteering is a great experience for interaction with your group, but we understand that it isn’t for everyone. Clip ‘n Climb staff will also be circulating around the climbing arena attaching participants onto ropes and ensuring that everyone is happy and enjoying themselves. Do I have to Clip other people’s children? 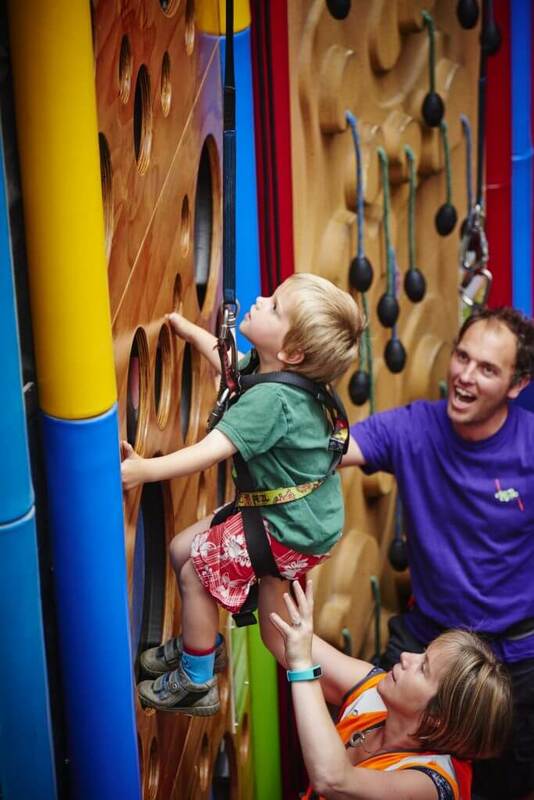 We feel that one of the great things about Clip ‘n Climb is that parents have the opportunity to get involved in the experience and choose to volunteer to become a clipper. If you choose to volunteer you don’t have to clip everyone’s children – we understand that you want to interact with your family and friends. Clip ‘n Climb staff will also be circulating to ensure that anyone without a family member or friend clipping them is also enjoying their experience. Which climbs are the easiest? We have a smaller training area and a number of easier climbs, including Amazing, The Big Cheese, and Hexed to name a few. However, it’s probably best to ask our staff who are on-hand, and they can give you a few tips if you are finding things a bit tricky. If you are finding things really easy our staff can also give you some harder challenges to try too! It’s always advisable to book online (especially at weekends and during holidays) as we often sell out sessions. Sometimes it’s possible to book a session last minute on the day, but we can’t guarantee there will be availability. You can check our availability 24hrs a day online. You can book your session here. Do I have to book over the phone? The easiest way to book is on the online booking page but if you are booking in with a voucher or trying to book a birthday party package or have any other special requirements, we recommend you give us a call on 0191 91 70 360. Do I have to book the Leap of Faith/Vertical Drop Slide in advance? You can easily book this in advance if you wish, but it is usually possible to buy a Leap of Faith on the day, your instructor will explain how to do this during your session briefing. Yes we do. They are available to purchase over the phone or in person. These can be posted to your home address for just a small surcharge to cover postage costs. Do I need to hire any equipment? No, all safety equipment will be provided. Simply wear appropriate clothing for the activity. Note: Please be aware that we cannot allow participants to wear their own climbing harnesses. Our birthday parties cost £15 per person. This includes climbing, party food, and a booking in one of our party rooms. A minimum number of 8 people is required to book a party.